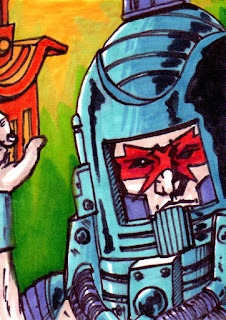 Taylor's Sweet Little Art and Nerd Site: Sketch Card of the Day- Man-E-Faces! Today's deviation is Man-E-Faces, and just to let you know, he's not two faced, but threed! Ok, that was bad, but in the humor of being "two faced", he would actually be three faced. So does that make him like the plot twist of Indianan Jones and the Kingdom of the Crystal Skull, with the multitude of poorly written triple agent character changes? No. Man-E is much better than that. Much better. He has three faces that help him with different superpowers. It's kind of like a dial a strength on the top of your head, if your face was in a television box of sorts. His first face is a human face, so this would be his heroic face. Not sure what the power is on this face, but I'll say it's WILL power. Second face would be a monster face, and this face is STRENGTH! Lastly, his third face is his robotic face. This face would be the face of LOGIC. I don't remember Faces that much in the vintage cartoon series, but he played a big role in the 200X one. I would say that he is arguably one of my favorite characters, and yes, I do own a full run of Man-E-Faces from vintage to 200X to Classics. 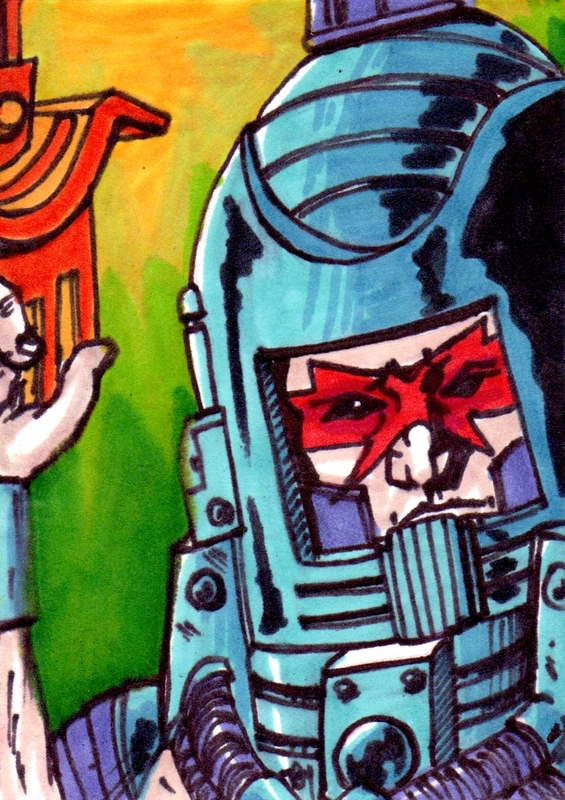 This sketch card of Man-E is based on the Classic figure which is based on the vintage package art. You can also see this sketch card here.